Difficulty Notes: Routefinding will dictate whether this scramble is class 3 or 4. We took the ridge to the summit which is very exposed but avoidable. 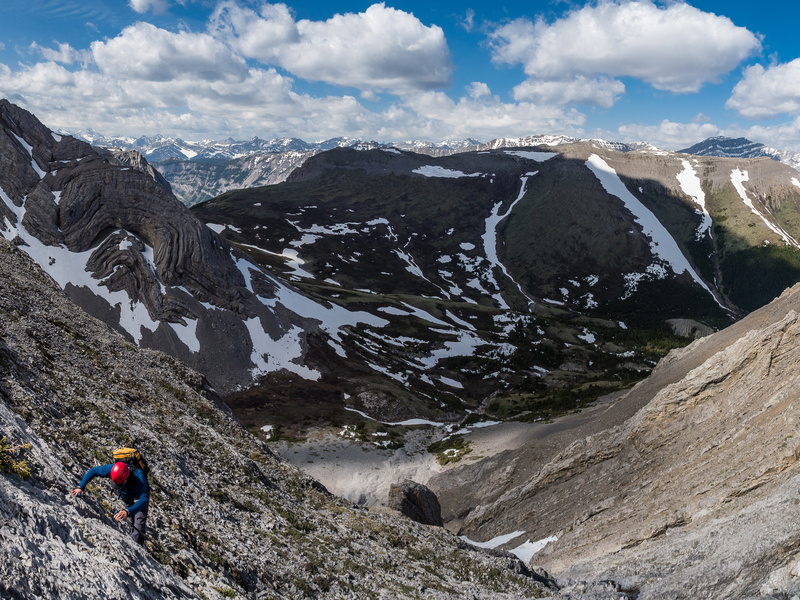 Spring scrambling in the Rockies around Calgary has always been an interesting game of trying to decide what’s in shape and what is still out of scrambling condition. 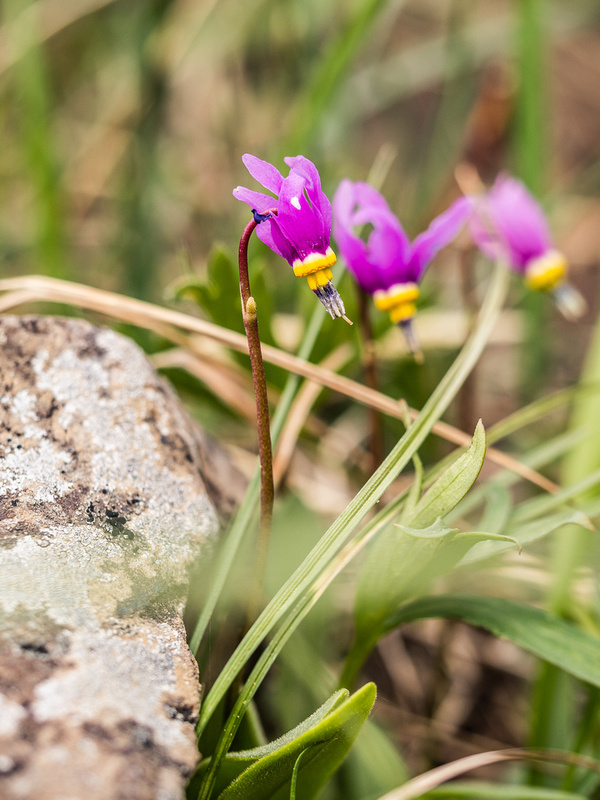 With the prevalence of social media, the game has become somewhat rigged with a flood of trip reports coming out after every weekend from all corners of the Rockies, indicating successes and failures and giving updates on current conditions. This up-to-date information flood is excellent, of course! It also means that certain areas and certain peaks get a lot more focused attention than in the past. 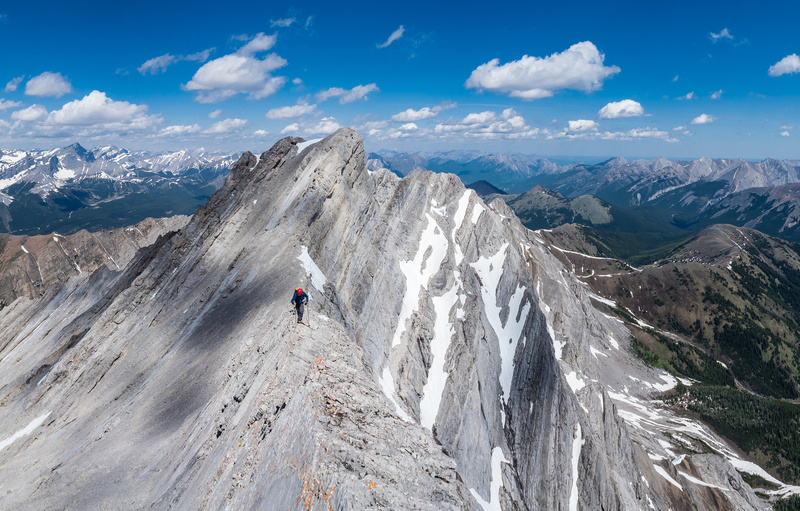 I’ll admit, I’ve taken good advantage of other reports so far in 2018 – ironically all the peaks that I’ve done this for have been on my list for many years – I’ve just been beaten to most of their summits this year for some reason or another. The first thing to note is the number of folks who go up the south side of Grizzly Creek from the Grizzly parking lot along hwy 40. This is puzzling, if for no other fact than that’s the steepest and most heavily forested side of the creek – why would that be the first route choice? Ah well – with all the guidebook information I guess hindsight is 20/20. 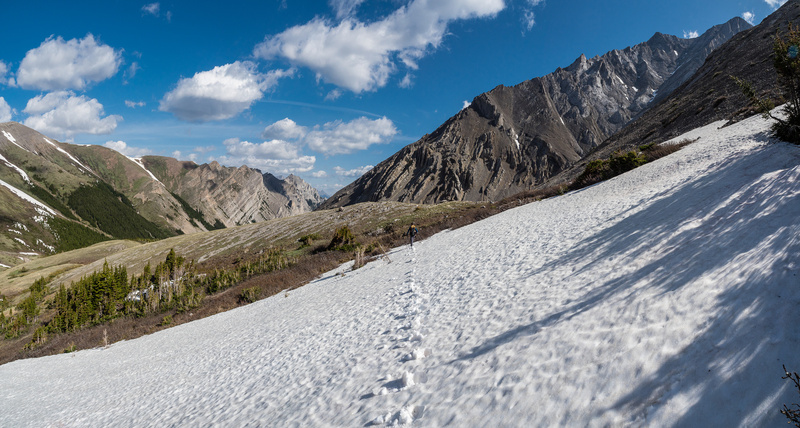 Despite some trip reports suggesting otherwise, there is a good trail / track the entire way up the north side of Grizzly Creek from the powerline right of way to the upper meadows under Potts and Evan Thomas Peak. The track can be hard to follow across all the avalanche gullies on route, but if you get to the opposite side of such a gully and you’re not back on trail, spend some time searching around (usually higher up) and you should find it back. It’s worth staying on track to avoid side-hilling. 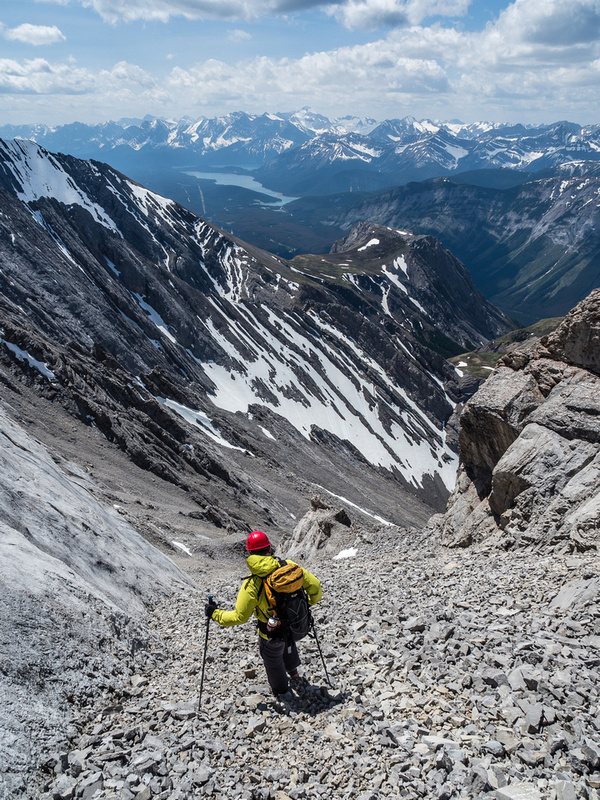 The basic rule-of-thumb on this approach is to stay under the cliffs above on your left, but fairly high above Grizzly Creek on your right, despite cairns in the creek – it’s not your friend. 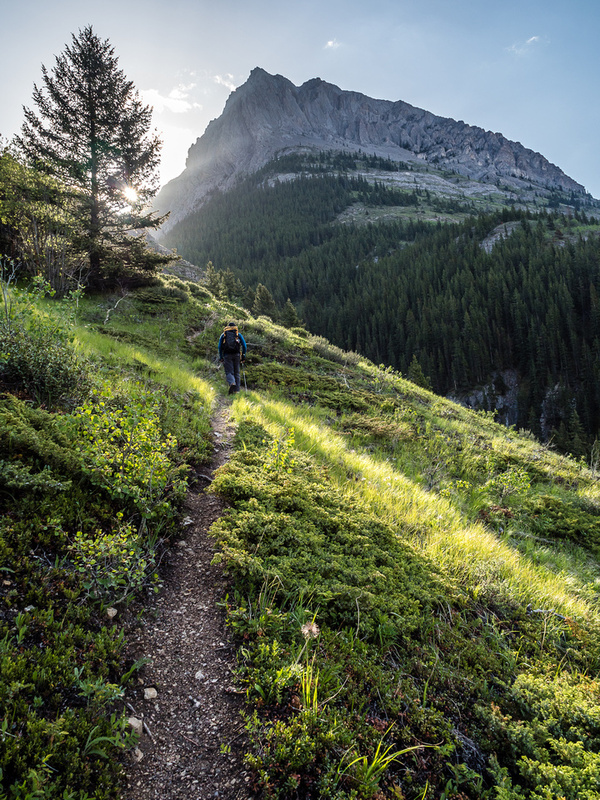 A gorgeous morning on the trail ascending the south banks of Grizzly Creek. The morning was simply gorgeous. The sun was rising ahead of us and the birds were serenading our efforts. Despite having a cold, I felt amazing as we trudged quickly up the very steep approach track. I love approaches like this one! 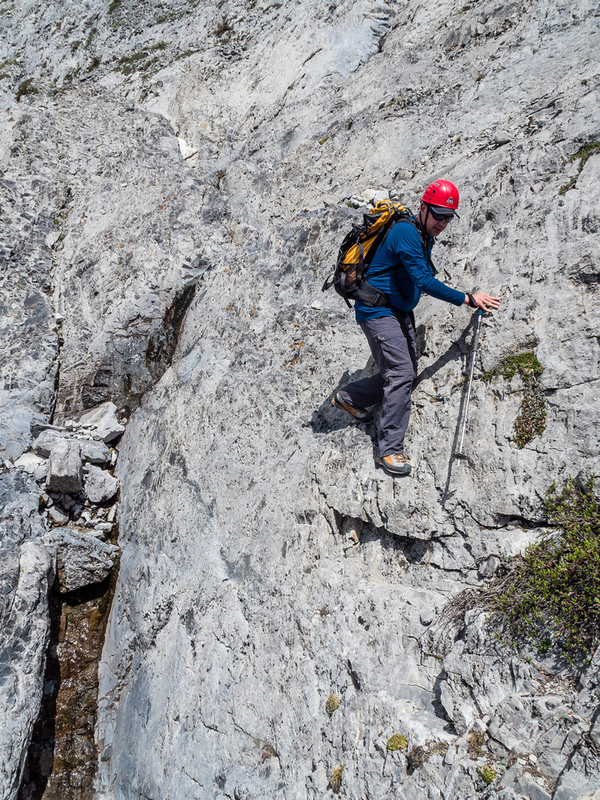 I always play little head games while climbing or scrambling and my favorite is the “approach” game. Ask Phil about it – it drives him nuts. The basic gist of the game is to ignore the approach as inconsequential – only allowing myself to start feeling the mountain once I’m off the “approach”. Different trips have different length approaches. On Ochre Spring Peak the approach was treeline. That meant I only had to feel about 500 vertical meters instead of 1300 since the approach doesn’t really count. I’ve done approaches as short as 1km and as long as 35km. It all depends on my mood and the objective. 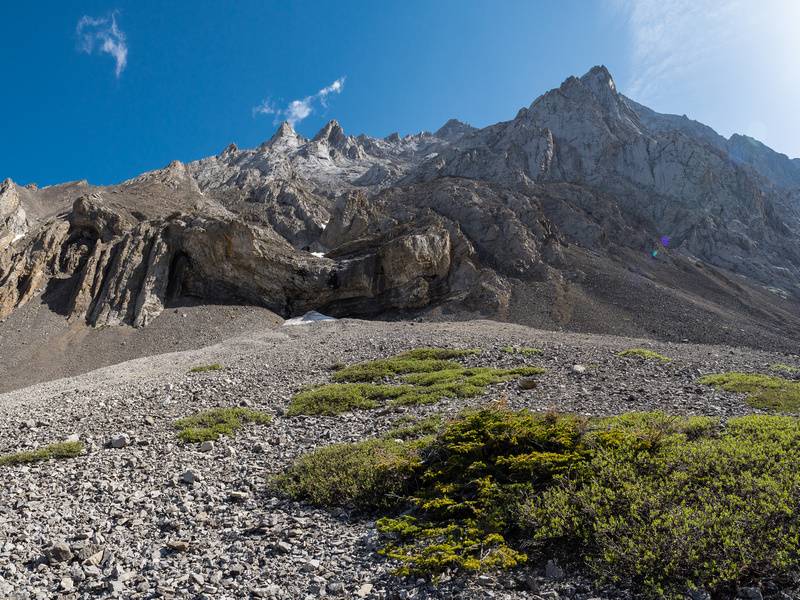 In the case of Mount Denny, the “approach” is awesome and quick and gains at least half the necessary total height gain. Once we started approaching the upper bowl between Potts and Evan Thomas we deviated up left hand (north) slopes to the Opal / Potts col. This is a lovely spot and well worth a day hike on its own. From here we had great views of Grizzly Peak and Evan Thomas to the south and Opal Ridge stretching out to the north on our left. We started a lovely traverse through open meadows along the west shoulder of Mount Potts until our objective became clear. Mount Denny rose impressively into the morning sky as we lost a bit of height and started hiking towards the intimidating lower slopes near an impossible looking wall of rock. 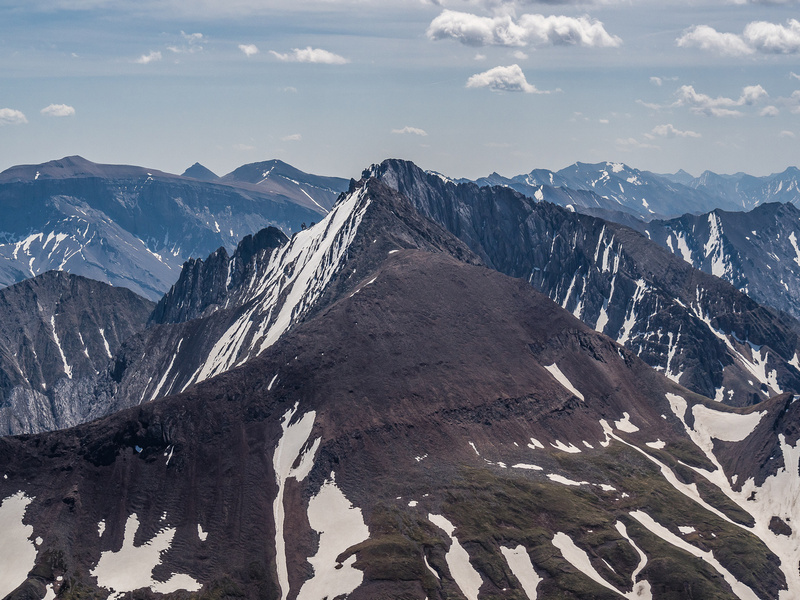 Gorgeous scenery from the Potts / Opal Ridge col looking towards Evan Thomas (L) and Grizzly Peak (C). We took a short break in the meadow under the SW face and tried to find the scrambler(s) that were ahead of us. Sure enough! 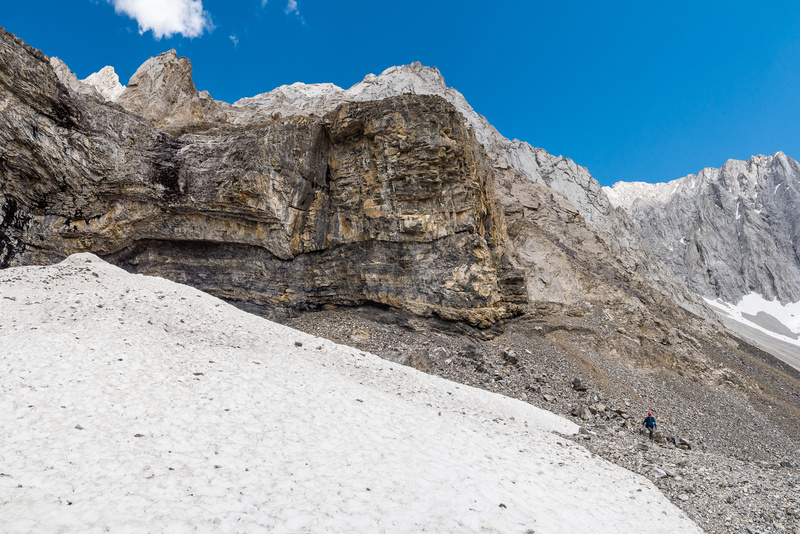 We soon spotted a lone figure starting up the face just above the lower scree access ramp. The good news was there looked to be only one person ahead of us and (s)he was high enough on the face that they’d likely not be an issue for rockfall. We donned brain buckets and proceeded to the route. Clouds were forming already to the west, not a huge deal at this point but annoying since the forecasts had all agreed that today would be 100% sunny and extremely warm. I’m starting to distrust mountain weather forecasts more and more lately. The only semi-accurate predictions seem to come out of avalanche.ca/weather and SpotWX is about 50/50 on accuracy at best. The lower scree / slab ramp that accesses the main SW face of Denny isn’t as hard as it looks from afar but was ‘moderate’ and loose. Mount Denny from just before the meadows to its base. 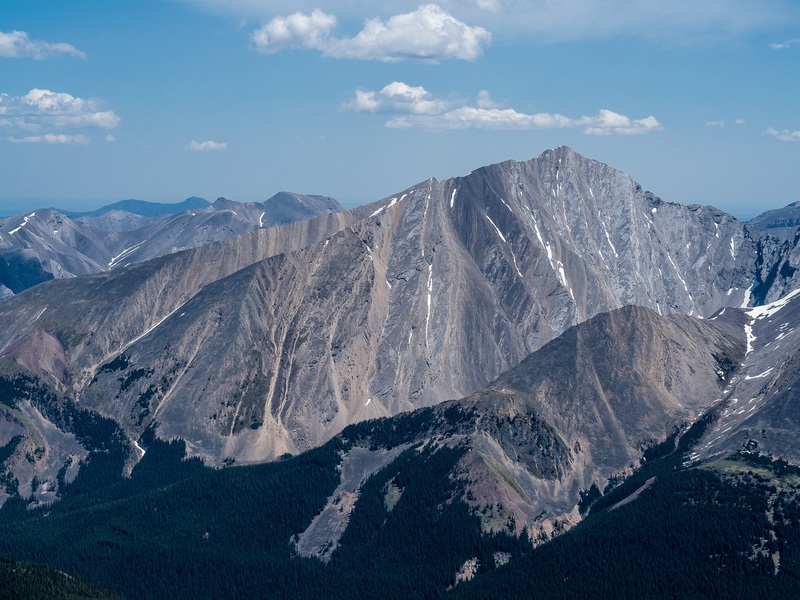 The route is obvious from here starting at center and rising between the twin summits above. Approaching the twisted rock at the bottom of the SW face. We’ll ascend the only obvious line right of the overhang at center. Engaging the slab with the infamous Orangutan face looking on from across the valley. After the access ramp, we turned our attention upwards and were relieved to see the lone scrambler high above us to the left of the gully. This was very considerate of them as rocks wouldn’t rain down on us from there. I have to admit that both Wietse and I were surprised by how easy the next 500 or so vertical meters of the SW face were. Varying trip reports had called this “600 vertical meters of hands-on slab scrambling” and even “an easier Mount Smuts”! Not for us it wasn’t. Admittedly, we don’t usually look for the hardest terrain on scrambles, usually choosing the easiest line up our objectives as long as it’s still fun (i.e. 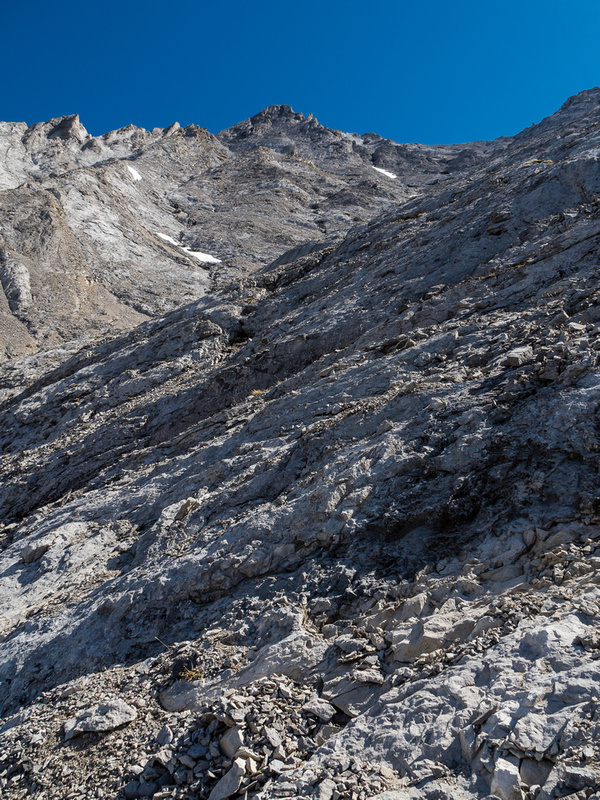 avoid scree if possible and safe). There is plenty of room for upper moderate to difficult scrambling on Denny’s SW face, but it’s all easily avoidable by simply sticking closer to the central gully. We stayed on climber’s right of the gully which was holding snow and running water, but didn’t venture too high above it either. Generally we were on a mix of scree and slabs but never on treadmill scree for long. 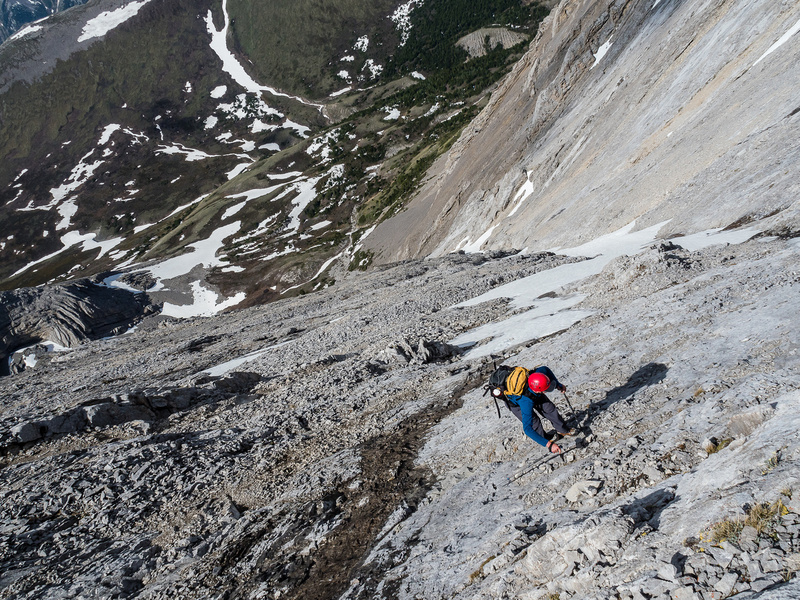 Parts of the SW face are very quick to ascend on nice, moderately angled slabs. I was apparently going fairly quick on this particular day as Wietse kept telling me to “slow down a bit”. I’m not sure why, but I felt really good. The weather was perfect – cool and just enough clouds to prevent heat stroke. The terrain was easy and quick to ascend. The views were opening up and were stunning. It was shaping up to be a very good day. As we ascended to the last bowl under the two summits of Denny, I couldn’t believe how quickly we were ascending. 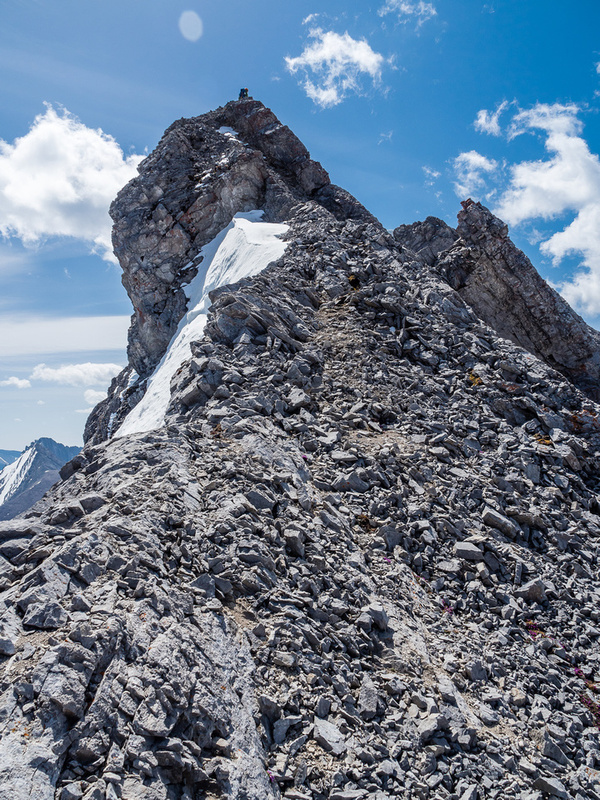 Compared to the interminable slope on Ochre Spring Peak the weekend before, this 1350m ascent was a breeze! 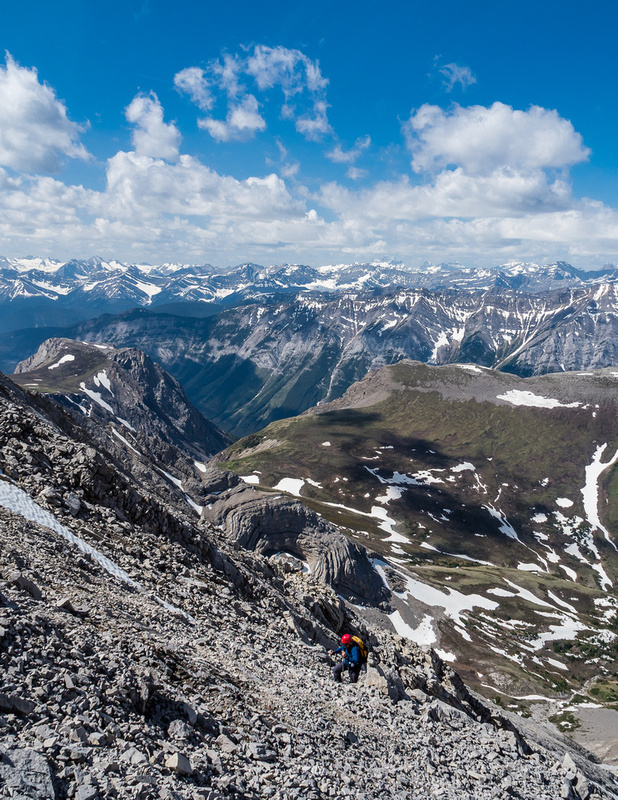 I picked a route up to the ridge between the two summits where I finally met the solo scrambler coming off the north summit on traverse to the south. It was Alex Privalov, a Facebook friend and experienced scrambler which explained his obvious scrambling skills and thoughtfulness to take the harder left hand side of the face to avoid kicking rocks on us. I thanked him for his consideration before he continued up the ridge to the south summit and I waited for Wietse. The ridge to the south summit looked pretty darn intimidating but I wanted to give it a try before going up easier terrain underneath it. 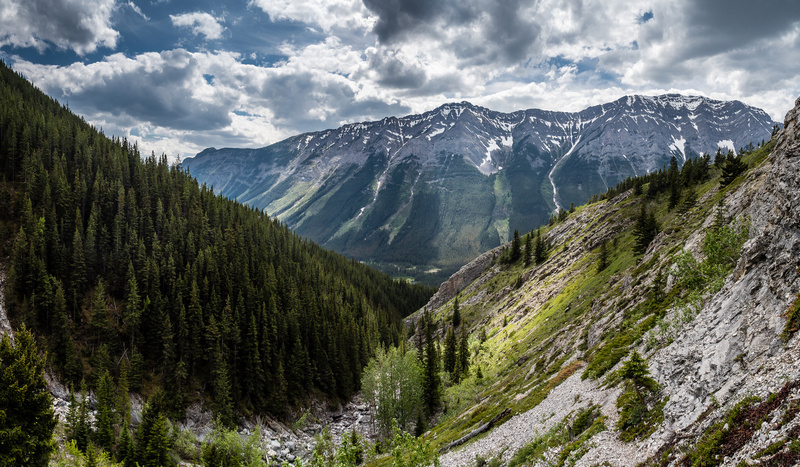 As we ascended the spine of Mount Denny, the exposure to our left (east) was crazy! It didn’t help that the sidewalk we were on was tilted in that direction either. Falling to the west might be survivable here, but slipping the other way would be 100% fatal. 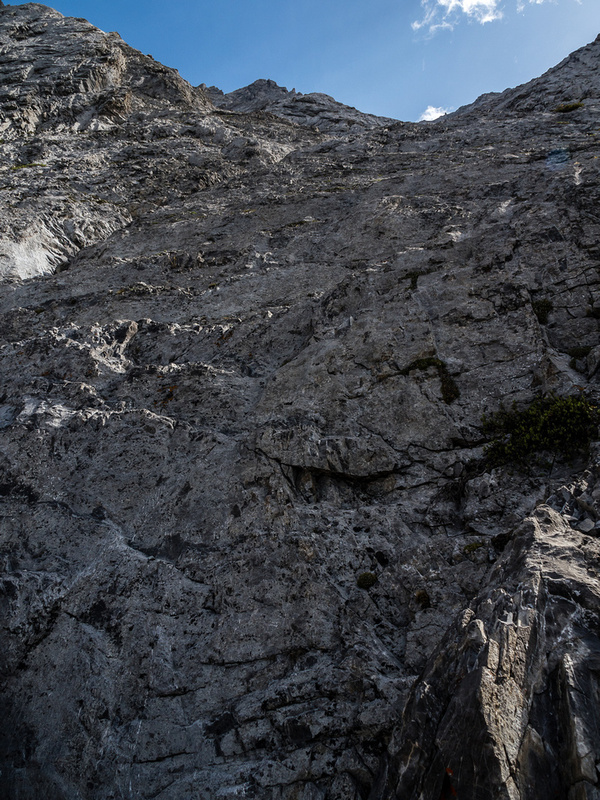 This route cannot be considered ‘moderate’ – and is not the recommended Kane route to the summit. It was much easier than it looked and offered some spectacular positions. 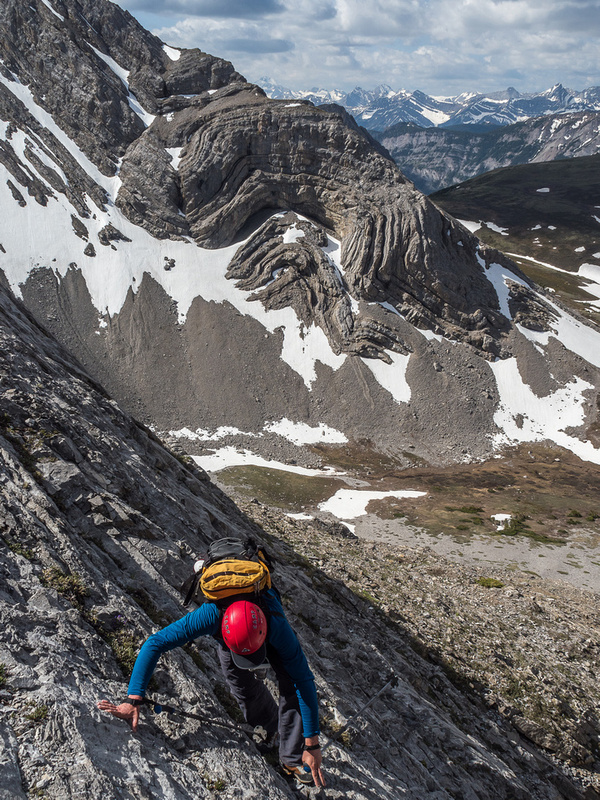 I highly recommend this route for experienced scramblers who love exposure. Soon we were done the exposed ridge and hiked up to the summit to join Alex in a surprisingly cold wind with unsurprisingly good views in all directions. 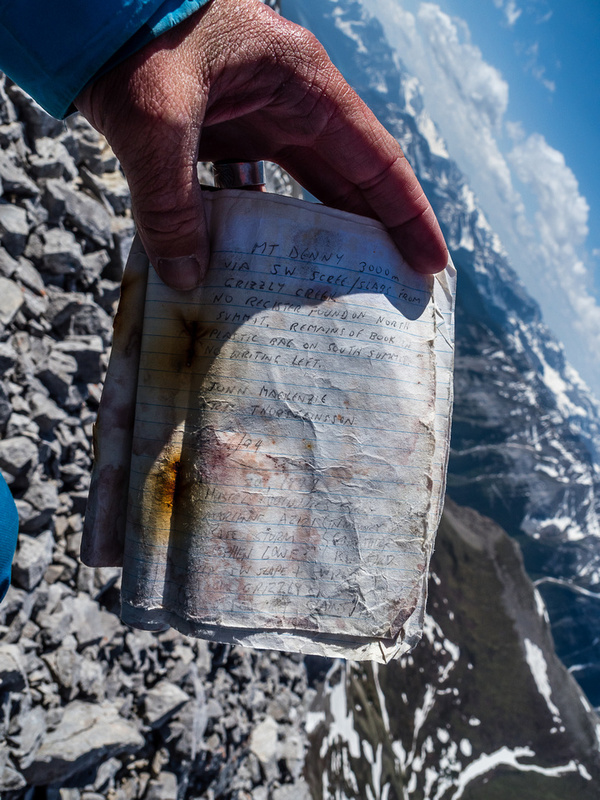 The summit register was fairly old but clearly showed when the guidebooks started popularizing the mountain with a flurry of activity since around 2012. We wanted to linger, but I hadn’t even brought gloves considering the forecast, and my hands were freezing. After taking photos and eating some lunch we bid Alex adieu and made off for the north summit while he started his descent. Looking back at Wietse following me up the very exposed ridge on Denny. The fact that it slopes to the huge exposure off the east face makes it even more interesting. 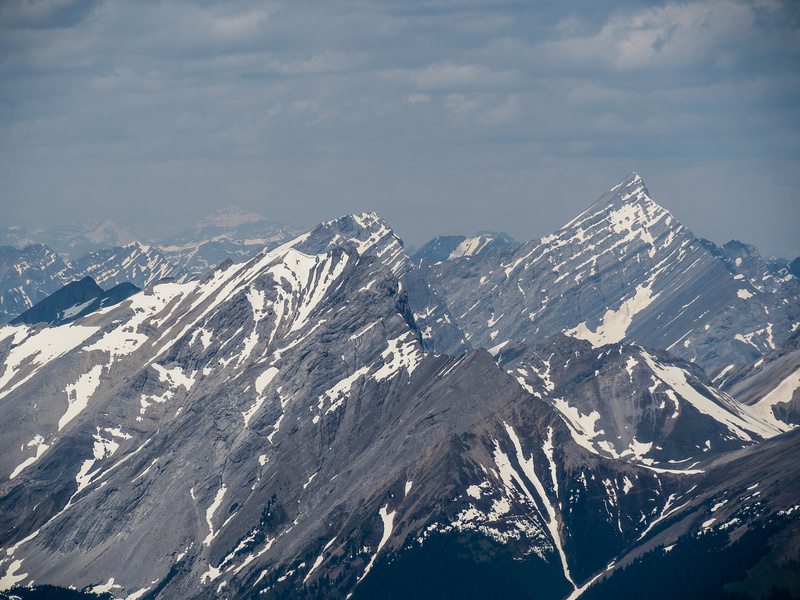 A huge panorama of very familiar peaks looking north (L), east (C) and south (R) includes (L to R), The Mackay Hills, McDougall, Fisher, Fullerton, Romulus, Potts and Evan Thomas among many others. 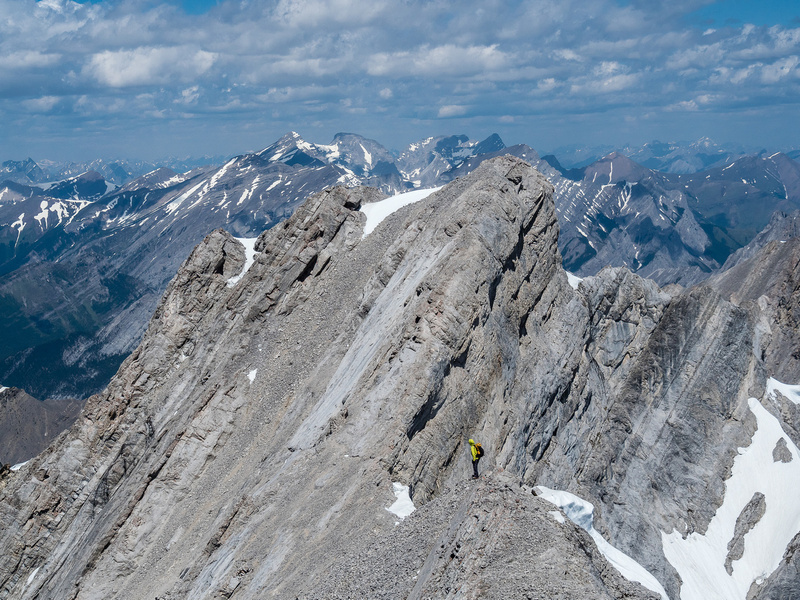 We could have descended the easier terrain directly under the south summit, but we chose to retrace our exposed ridge route and lose less height to the north summit instead. This worked well except for one tricky slab traverse that we stubbornly stuck to rather than lose 10 feet of extra height. Idiots. Ah well, we gained some slab scrambling experience for some day when we really need it. 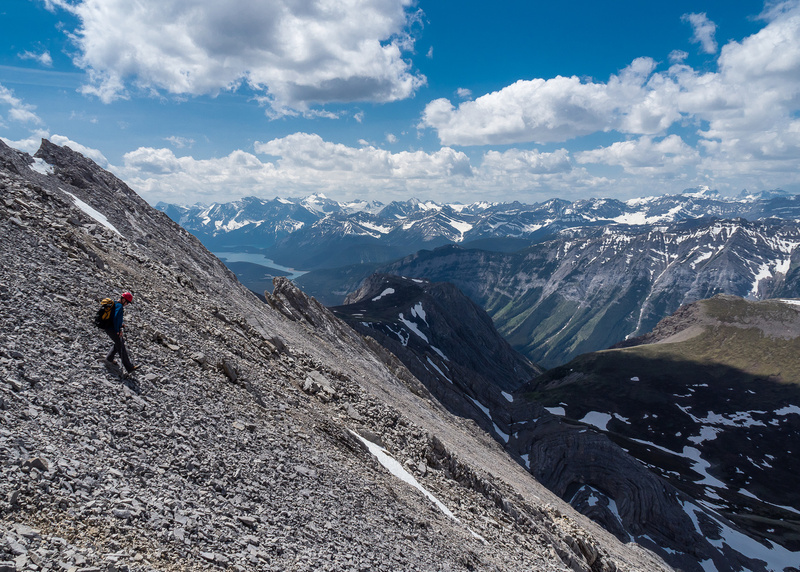 After groveling up a short, steep scree gully we popped out on the north summit which seemed lower than the south to me, but offered wonderful views. Once again, the cold wind chased us down faster than we liked. 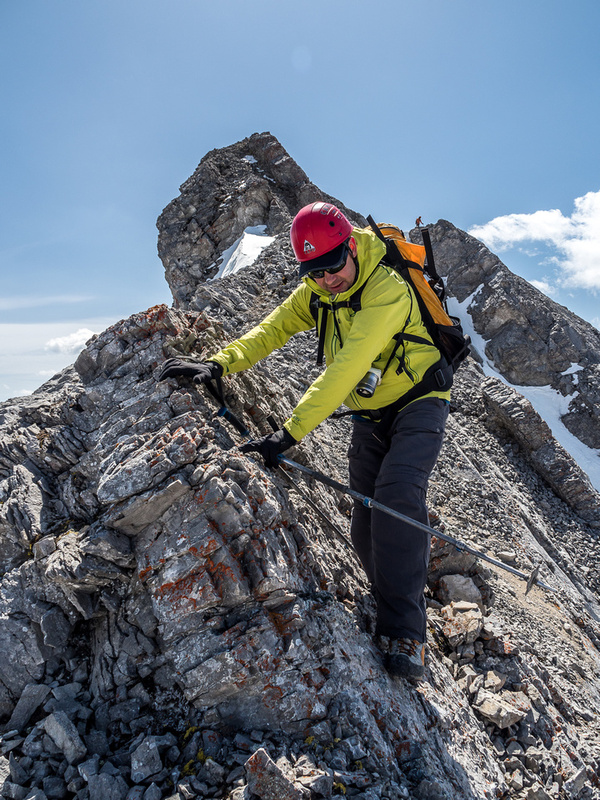 Wietse descends the very exposed ridge towards the north summit of Denny. Past the crux there’s still a few moderate scrambling moves. 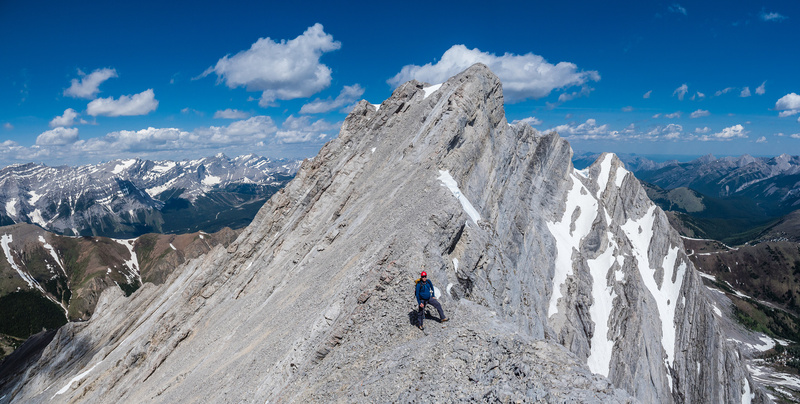 The views from the north summit of Mount Denny are fantastic and well worth the 10-15 minute diversion. 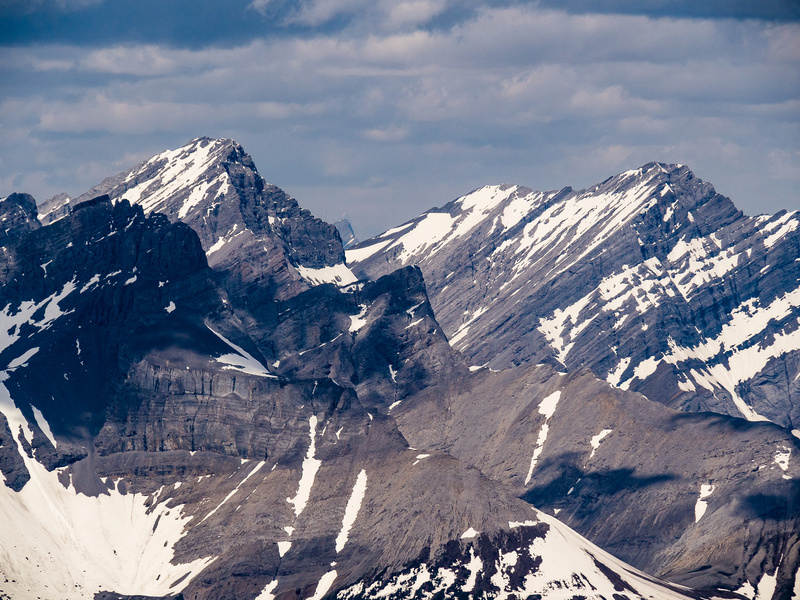 Mount King George with Prince Albert in front and Prince Edward looking fierce at right. The descent was easy and quick. We found enough scree to make things quick and were grateful for a few cairns we’d assembled on ascent to guide us down the easiest terrain. We briefly got off track at the very bottom of the face, but managed to correct ourselves and descend the proper ‘moderate’ access ramp past the overhanging wall at the bottom of the slope. The rest of the hike back to the parking lot was warm, pleasant and gorgeous. There were a few ‘delicate’ moves but most were avoidable if we wanted. I highly recommend Mount Denny for scramblers looking for something a bit different. 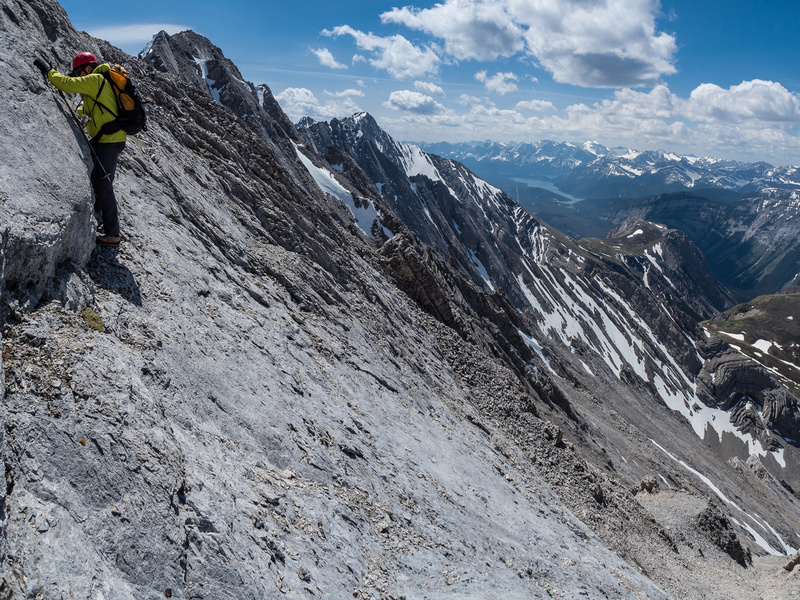 The combination of a gorgeous approach up Grizzly Creek and interesting face / slab scrambling to some of the best views along hwy 40 makes for a very rewarding day out. The fact that this is a relatively short and easy day trip is a bonus. 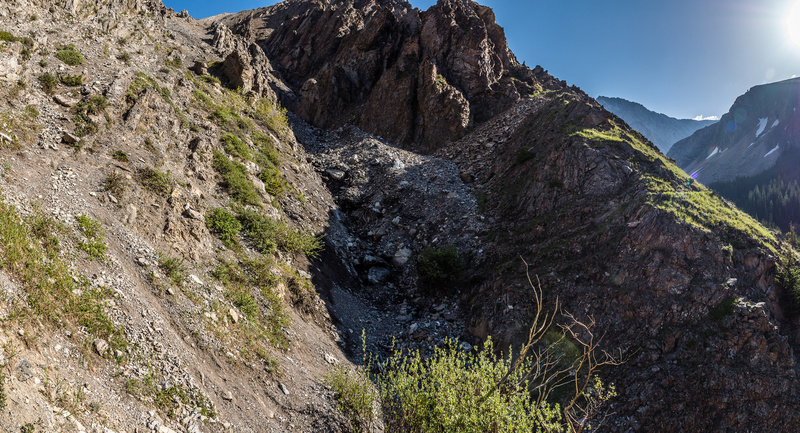 Just one example of the interesting avalanche gully crossings along the trail. Typically they are marked with cairns. 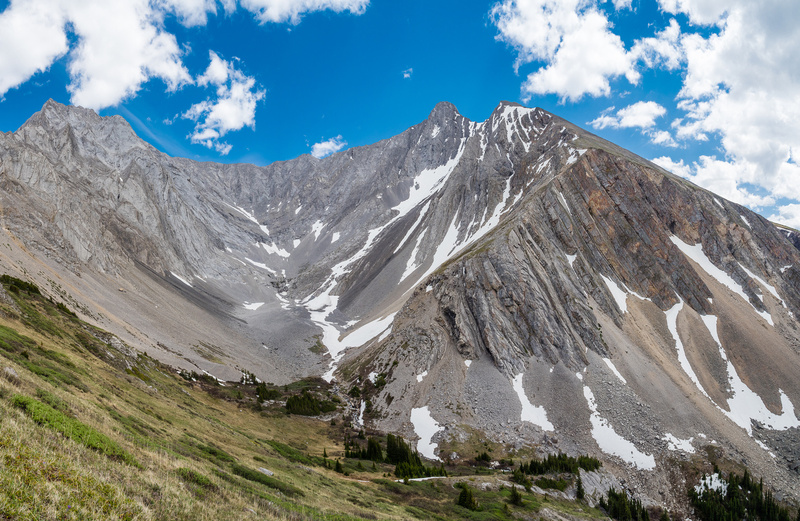 Approaching the head of the Grizzly Creek valley with Mount Potts at center and Evan Thomas rising at right. We'll go a bit further here before turning uphill to the left. Crossing a small patch of snow with Denny now visible rising to upper right. Opal Ridge at left. Approaching the twisted rock at the bottom of the SW face. We'll ascend the only obvious line right of the overhang at center. Looking up - looks like fun! Alex chose a line on the left side of the drainage and ended up crossing some of the snow patches visible high above us here. Nearing the scree bowl under the summit ridge now. Grizzly Peak (L) looks tiny. GULP. Alex P disappears over the ridge to the south summit. Wietse at the col with the north summit behind him. We'll tag the official, south summit, first. The register is 24 years old but has been filling much quicker since around 2012 when it was first published on the Internet. It's much colder than it looks, but the view is tough to beat. Looking over Evan Thomas East Peak towards Cornwall, Banded and Outlaw. Looking towards Gusty and The Tower. 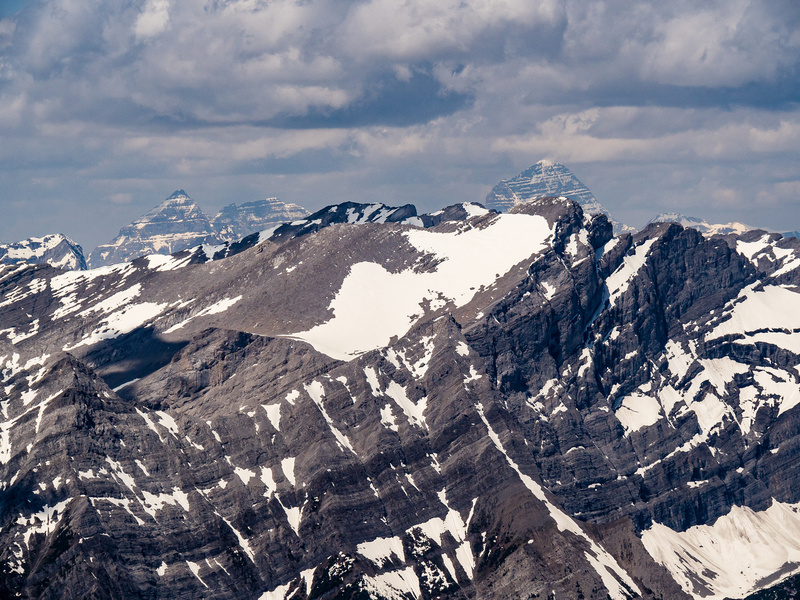 Eon, Aye and Mount Assiniboine show up over Mount James Walker. 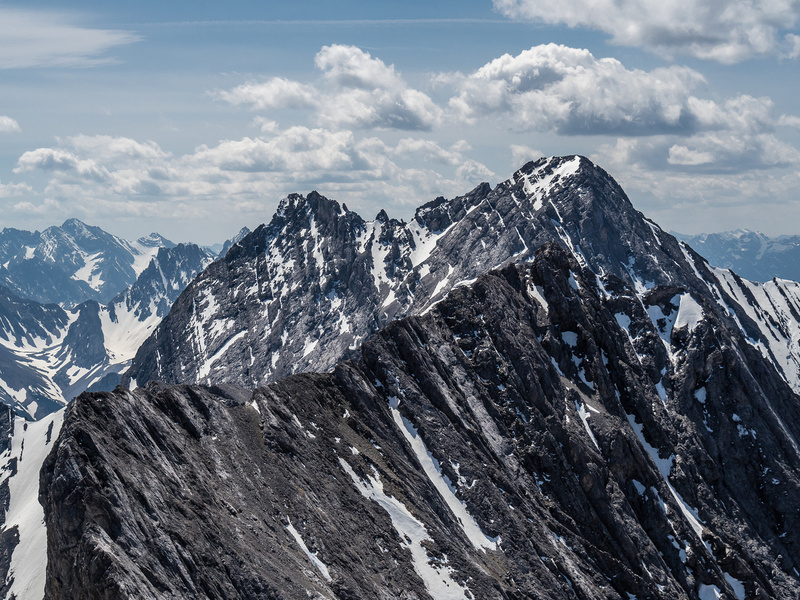 Excellent views towards the Aster Lake region including Joffre, Marlborough, Mangin and Cordonnier (L to R). 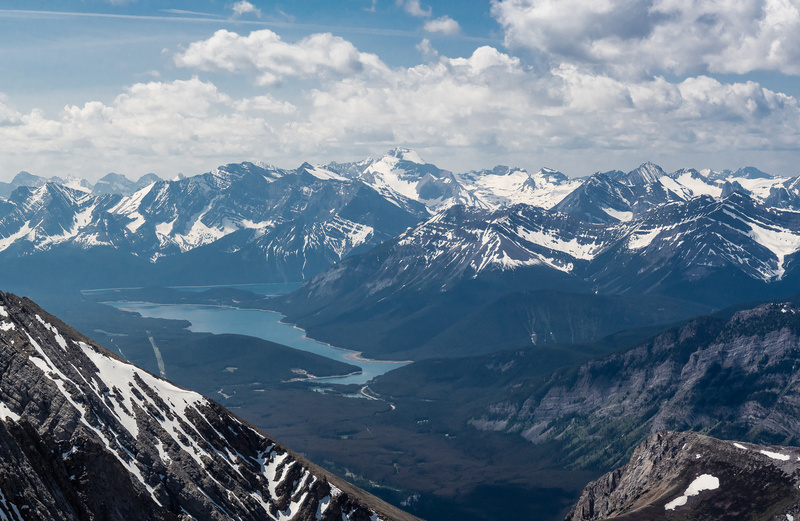 A slightly wider view towards the Aster Lake region with the Kananaskis Lakes at lower left. Foch, Sarrail, Indefatigable, Warrior, Lyatey and Invincible now showing up. On the ridge. I haven't shown the most exposed section as I didn't have my camera out for that. Past the crux there's still a few moderate scrambling moves. 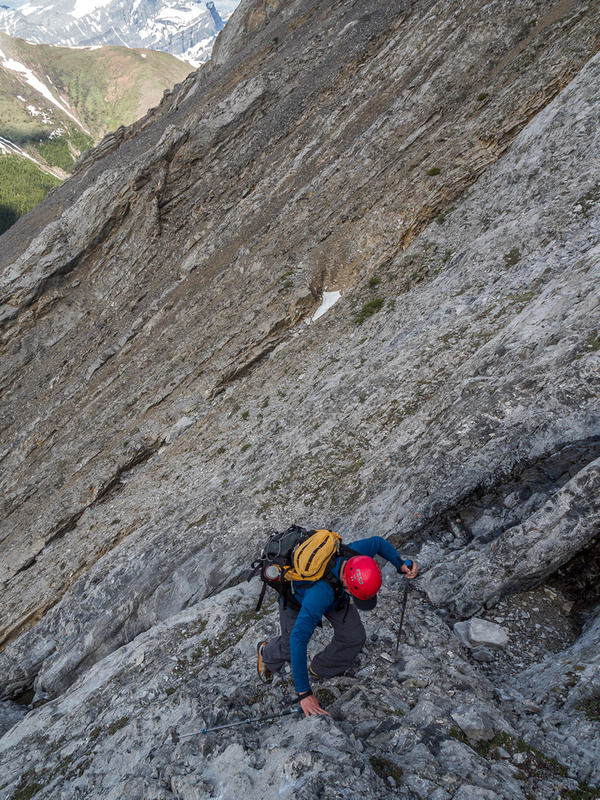 We could have avoided this tricky little slab traverse by losing about 15m of height under this slab, but we were determined to make it across for some reason. The views from the north summit are fantastic and well worth the 10-15 minute diversion. Views north (L), east (C) and south (R) off the north summit. Mount Fisher at center steals the show. 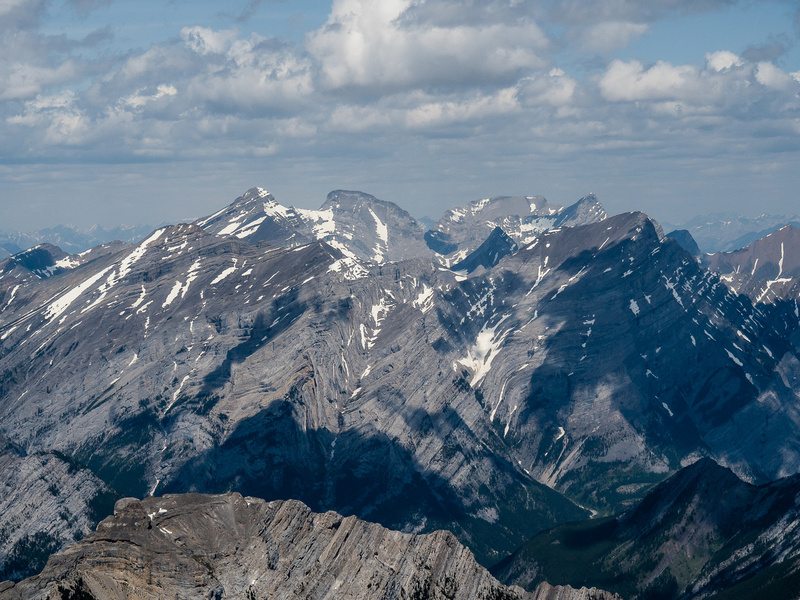 Looking over Opal Ridge North towards Kidd South, Bogart, Sparrowhawk, Ribbon and Mount Kidd (L to R). 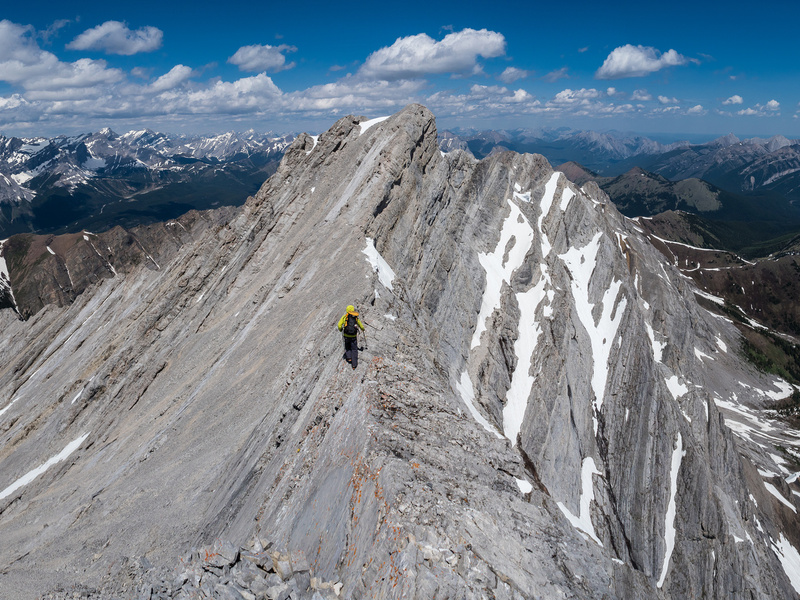 Mount Fisher is still one of my favorite Kane scrambles. Easy scree slopes from the north summit into the upper bowl. Descending the upper SW face Descending the upper SW face on scree.on scree. There were a few 'delicate' moves but most were avoidable if we wanted. Looking back at the overhang at the bottom of the SW face with Wietse just exiting the slope. 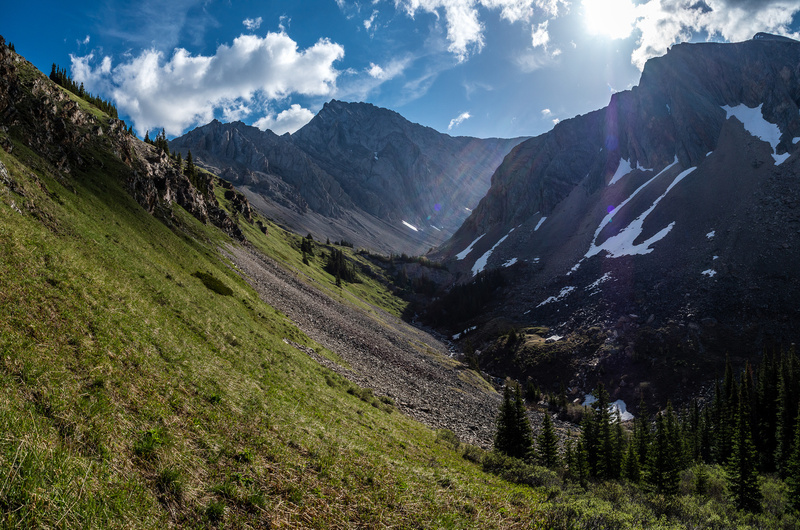 The lovely upper Grizzly Creek Valley with Potts at left and Evan Thomas at right. Nice lighting as we descend the Grizzly Creek trail towards hwy #40.